We know that all 7 elves (let’s call them E1 to E7, in increasing order of age) were working together on some day, so let’s call that Day 0 and number all subsequent days accordingly. 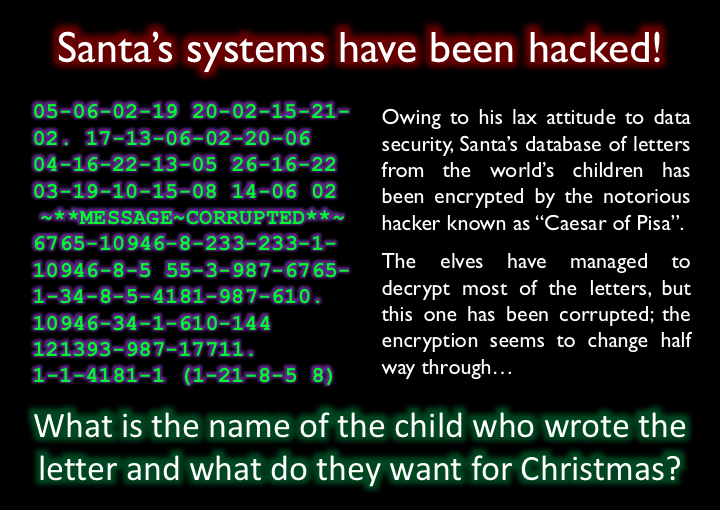 We also know that 6 elves were working on 1st December, so just 1 elf was missing. Now, the missing elf can’t be E1 (who works every day). It also can’t be E2, since that would mean that 1st December was an odd numbered day, so E4 and E6 would not be working either. Nor can it be E3, since that would imply that 1st December was not a ‘multiple of 3’ day, so again E6 would not be working. 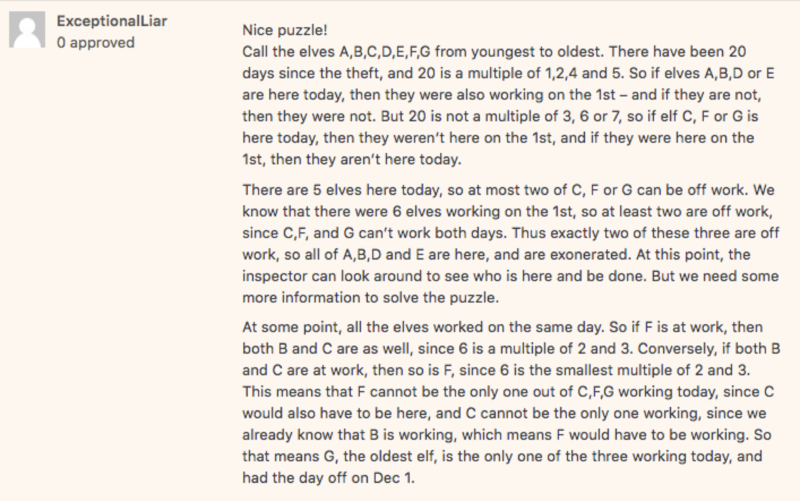 Finally, the missing elf can’t be E6, since that would imply that 1st December was not a ‘multiple of 6’ day, so at least one of E2 and E3 would not be working. So the missing elf was E4, E5 or E7. 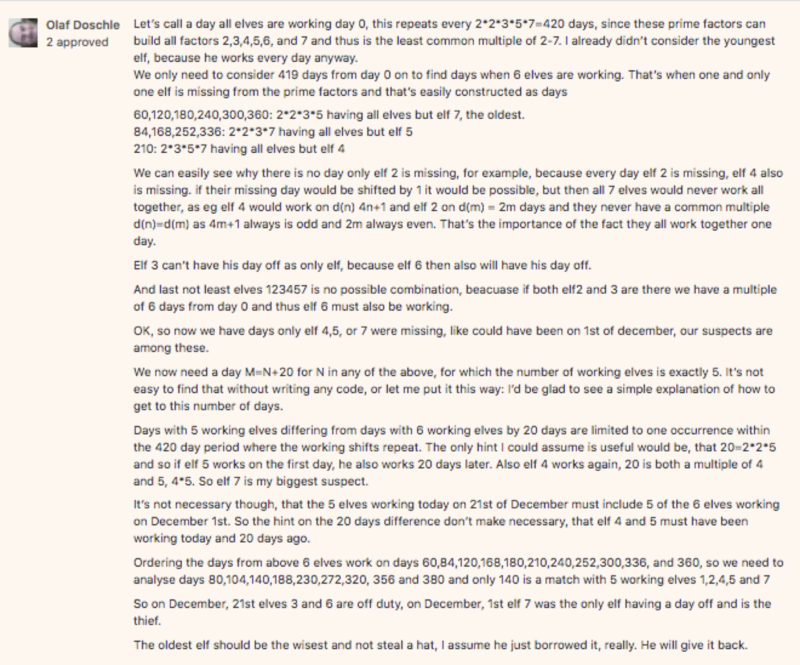 We now know that E1, E2, E3 and E6 were working on 1st December, and 20 days have passed since then, so E1 and E2 must also be working today (since 1 and 2 divide 20), while E3 and E6 must NOT be working (since 3 and 6 do not divide 20). Since there are 5 elves working today, that means that E4, E5 and E7 must all be working. But that means that E4 and E5 were also working on 1st December, 20 days ago (since 4 and 5 divide 20). 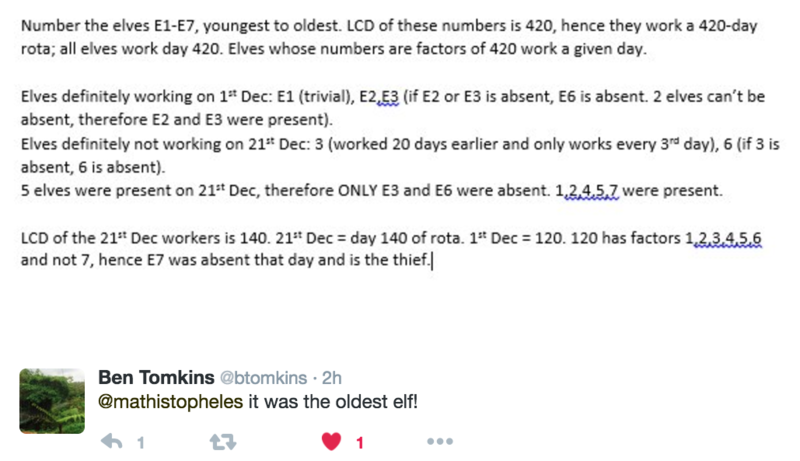 Therefore, E7, the oldest of the elves, is the only one who was not working on 1st December. So the oldest elf is the thief! Brilliant response to this puzzle again, with some serious effort going into the solutions. Along with explanations of the logical reasoning (see below), there were spreadsheet based solutions (Kostas Cheliotis, Gareth Adams, Chris Emerson), a worked number theory solution (Shawn Chapla) and a programming solution (Eoin Travers). Other correct solutions came in from Troy ToTheWorld, Fergus Johnson and Catherine Evans. Congratulations to all on your promotion to Interpol’s new North Pole division. >while E3 and E6 must NOT be working (since 3 and 6 do not divide 20). That’s the thought I was missing. It was sufficient to know the elves E1-3 and E6 working on December, 1st to deduct E4 and E5 must have been working 21st to make it a bunch of 5 and thus also had worked on 1st. I never thought of that, I just thought about 4 and 5 dividing 20, not 3 and 6 not dividing it.